Varicose veins tend to occur as we age and often occur in the lower legs. The veins become enlarged and sometimes look as if they are twisted and bruised. The swelling can be painful causing legs to ache and feel heavy. Blood pools in the affected area and is an indication that the circulation is poor. The reason the blood pools is a dysfunctional valve. A variety of factors can lead to varicose veins. Prolonged standing is a factor, and is more likely to occur to people who have to stand for long periods of time at work such as factory workers or store clerks. Obesity is another contributor as the extra weight adds to the strain of the circulatory system. Hormonal changes and pregnancy can also assist the process. 50% of adult women are affected by the problem in varying degrees. 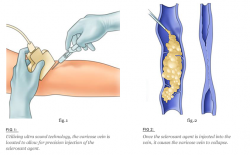 A frequently used treatment for varicose veins is called sclerotherapy. Small needles inject agents such as tetradecyl sulphate, hypertonic saline, and polidocanol into the affected area. Immediately after the treatment, the vein(s) is wrapped in a compression bandage. If the treatment is successful the vein will recover in approximately 3 to 6 weeks. Laser therapy is another option. Small amounts of intense light are focussed on the area, and after repeated treatments should gradually fade. This treatment works best on veins with very small diameters, and can be very painful. For larger veins sometimes surgery is needed. What can be done to Avoid Varicose Veins? Although it might sound odd, one of the leading causes of varicose veins is constipation. If you are struggling with bowel movements, your constipation could be redirecting your blood flow to more superficial veins. A diet low in carbohydrates and fat but high in fruits, whole grain and vegetables will help promote the flow. Make sure to include garlic, ginger and onions in your diet as these items help you to break down fibrin. Those who suffer from varicose veins have difficulty breaking down this material. If you are carrying a few extra pounds, you are applying extra pressure to both your circulatory system and heart. Losing the weight will help prevent the problem. Don’t forget to exercise on a regular basis as this is a feature of all wellness programs. There may be underlying nutritional problems that could also be causing problems. A few of the recommended supplements are Vitamin A which assists with the healing of ulcers. Ulcers are a serious complication of varicose veins and occur more frequently with the elderly. A B-complex vitamin should also be taken to enhance the health of your circulatory system. Calcium A will help to stimulate the venous system. Magnesium is another good supplement as it enables the muscles and arteries in the legs to relax. There are a variety of herbal remedies available. Horse chestnut helps the upward flow of blood, improves tissue strength and reduces the redness and swelling. Drinking tea several times a day combined with St John’s Wort, Arnica root, and Yarrow will also assist with swelling and redness. Do you want to be a candidate for varicose veins? Of course not! Simple straightforward preventative measures work. If you are already suffering from varicose veins there a variety of treatment options available. It’s your health and ultimately your choice.